This translation along with many other wrestling translations, were originally hosted on two sites (www.firewrestling.com and the author's official homepage.) When both sites went offline, they took the files with them. Thankfully, using the archive.org search engine, this file along with many of the other translations were salvaged. Hybrid Wrestler caught my eye due to its career mode. I had read some Internet reviews of the game that had originally made me not too interested in playing the game, but I soon realized that the evaluations I had read were not correct. 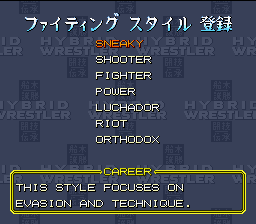 Hybrid uses a move system similar to the Fire Pro series and also adds a lot of gimmicks that appear in wrestling. Among these are scaffold matches and street fights. Also, wrestlers can use foreign objects, like boards, to whack their opponents. 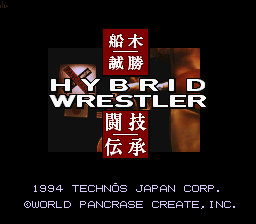 Unlike the Fire Pro series, Hybrid has no grapple system which make the gameplay more like arcade-style. Overall, the game is just fun. There is no particularly amazing part of the design, but it is one that, to my knowledge, has never been done before. I worked on a translation by context, as I don't know Japanese, for quite a while. 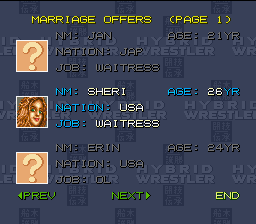 I never really expected anything to come of it other than a personal hack, but it turned out that I was able to find a large number of the labels in the ROM and provide decent replacements in English, even for the announcements. 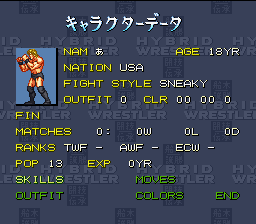 TakerDude (Dan) was going to help me finish up the patch and sent the name translations for the wrestlers, but has since gotten busy, so I decided to go ahead and provide the work-in-progress patch. Well, I had some extra time a few weeks back and bought a Japanese dictionary. This helped me to finish up the translation of Hybrid. This is still a translation by context, but the game is considerably more playable. I think almost all of the text is translated, but it is hard to tell due to the layout of the ROM. Q: How do you do the special moves in Hybrid? A: Check out the Moves FAQ. Q: What's the lineage option? A: This shows your family tree. In career mode, you can train your son once he turns 18. He will have your same outfit and will inherit your finisher automatically. Q: How do you do the power up move that you get from the training option in the career mode? A: I don't know. I've wasn't able to figure it out and I've never seen any of the moves done by a CP controlled player either. Q: How do you select the variations of moves (ie. I saw Silver do a Brain Buster)? Q: What moves can you get from the special training in the career mode? Note: The Moves FAQ is lost.